When the first cool days of autumn come around, I can’t help but want to cook. It’s soup season, after all, and the desire to have a pot of something savory bubbling on my stovetop is more than just convincing. There’s something so comforting, nostalgic, rhythmic and practical about taking simple and fresh ingredients and turning them into a nourishing meal. It’s part of the natural rhythm of life. What’s wonderful about a bowl of homemade soup is that it doesn’t need to be fancy. Made with the freshest ingredients available, it will always be real food, and it will always be good. Recently, a friend went apple picking and shared her crisp and sweet treats with me. I’m not sure of the variety of apple, but I just know they were delicious. So when I came across a recipe in Food & Wine for Curried Carrot and Apple Soup by chefs Tamalpais Star Roth-McCormick and Mark Slawson, I knew I wanted to try my own version of this velvety soup. Tamaplpais (who goes by Pai) is the creator of Bunches & Bunches Ltd. based in Portland, Oregon. A couple of notes, Pai’s original recipe suggests adding gingersnaps, but I opted to leave them out as I preferred to stick with the natural sweetness found in the carrots and apple. To make my version vegan I used coconut oil and coconut milk instead of butter and sour cream. And, to give it a little more heft, I served it with pearled barley. Brown rice, farro or another preferred grain would work equally well. In a large saucepan, melt the coconut oil. Add the onion, leek, fennel and a generous pinch each of salt and pepper and cook over moderately high heat, stirring occasionally, until softened and just starting to brown, about 5 minutes. Add the carrots, celery root, apple, curry powder, garlic, ginger and thyme and cook, stirring, until the carrots and celery root soften slightly, about 10 minutes. Add the stock and bring to a boil. Simmer over moderate heat, stirring, until the vegetables are very tender, 25 minutes. Discard the thyme sprigs. Working in batches, puree the soup in a blender with the coconut milk until smooth. Reheat the soup if necessary and season with salt and pepper. 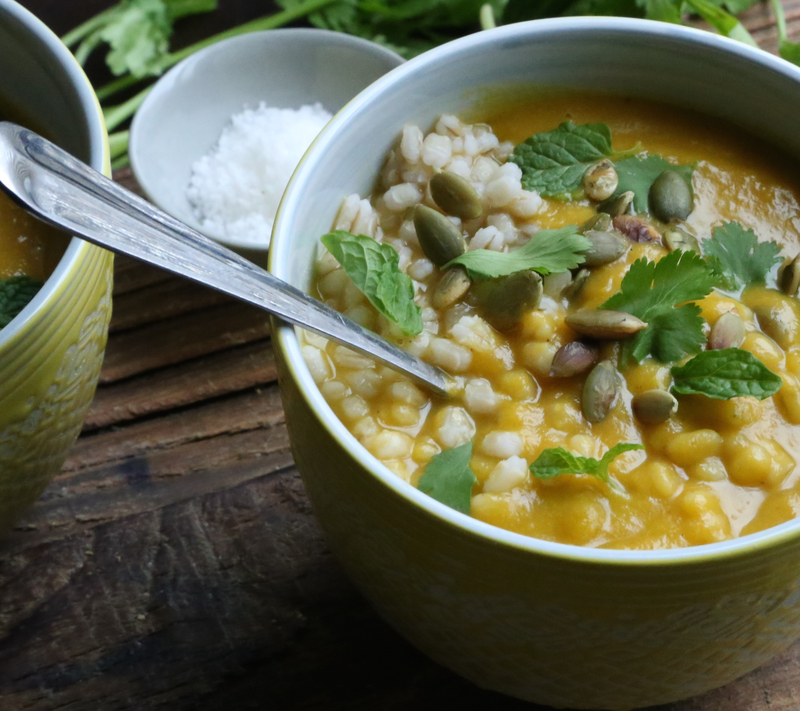 To serve, add barley (or other grain of choice) to bowls. 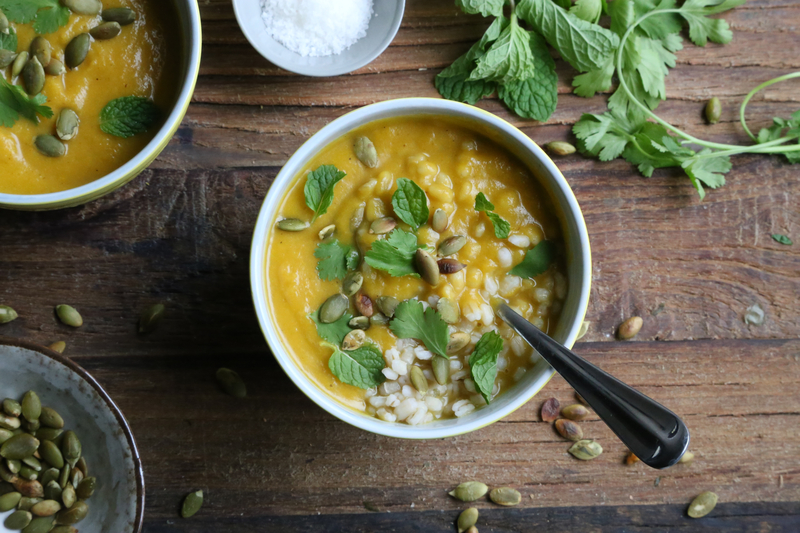 Ladle the soup on top and garnish with toasted pumpkin seeds and chopped mint and cilantro and serve. This soup can be refrigerated overnight. Reheat gently before serving. Hi Asmae, great idea. I’ll try to do that soon! Thanks for your interest! I have never used apple in a soup before.. definitely something that I need to try. 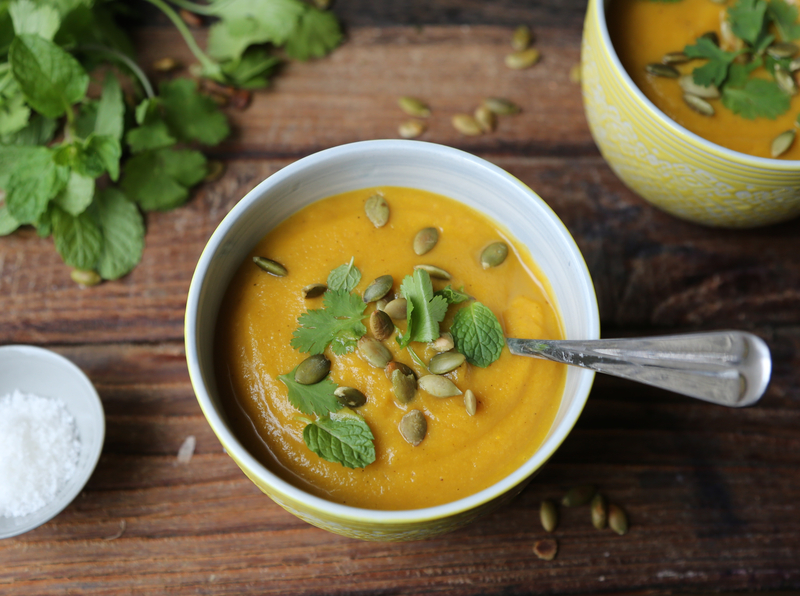 This curried carrot and apple soup looks seriously delicious and packed full of yummy flavour! Thanks Thalia. I hope you like it!